On 16-18 April, 2012, GEO was pleased to host attendees at our 13th Annual International Conference in Washington, DC. Thank you to everyone who attended, as well as to our speakers and event sponsors for their support. Presentation materials are available here. A special nightly room rate was available for attendees and exhibitors of the 13th Annual GEO International Conference at the Gaylord National Resort. At the Cherry Blossom Ballroom, Washington D.C. 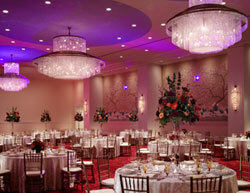 The Cherry Blossom ballroom is the perfect venue to host GEO's exclusive 2012 GEO Award gala. The Cherry Blossom offers stunning views of the Gaylord National's glass-enclosed atrium and the Potomac River and has quickly become the absolute "it" place for fashionable charity and social events in the D.C. area. The luxuriously appointed grand hall boasts a custom screen-printed wall featuring cherry blossoms in spring bloom. Three cut-crystal chandeliers inspired by local venues such as the Kennedy Center and the White House's East Wing Ballroom sparkle at the center of the room. Make your plans now to join us on April 17th for the 10th Annual GEO Awards, this is an experience you won't want to miss.